Plantronics Voyager B6200 UC BT Headset Black WW is a professional-grade communication device that has become the epitome of versatility and comfort demanded from headsets today. It offers users with premium features and functionalities, from the company’s clear talk technology that includes its enhanced noise cancelling technology integrated on the device’s microphone. Through this technology, users get to enjoy conversations without the existence of distracting background noises. Plantronics Voyager B6200 UC BT Headset offers users with multipoint technology that allows the device to be connected to more than 1 device all at the same time. This provides users the freedom to move around, without the hassle of cords and wires connected to all devices in a messy manner. 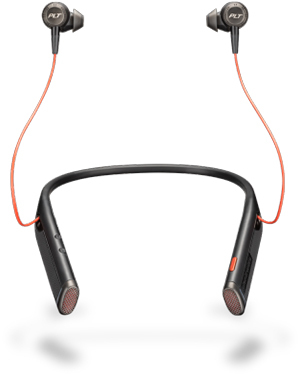 In addition to this connectivity, the headset also has a vibration feature on its neckband that alerts users whenever they is an incoming call. Do you want to talk to our experts and find out how to get this headset? Call Australia wide 1300 131 133 now! Plantronics is a leading consumer and business audio communications enterprise that conducts its major operations through its headquarters located in Santa Cruz, California. The company started out in the year 1961 and was able to establish its reputation excellently in the market by focusing on the development and innovation of audio and sound products and solutions capable of excellently catering to specific needs of all types of customers. It was renowned to be the first company to offer the market with lightweight headsets, the Plantronics MS-50. Plantronics is headed by President and CEO Joe Burton. The company has approximately 5,000 employed experts worldwide, helping the company to be able to excellently cater to customers’ needs through decades of experiences, powerful product portfolio, and top-notch and innovative employees. Its production and manufacturing floors are located in Mexico and China. And to top it off, it is supported by many service and telephony providers, OEMs or original equipment manufacturers, wireless carriers, retailers, and distributors in Asia Pacific region, Europe, and North America.